Producer Jenn Wexler has already made a pair of short films though until recently, she was best known as the producer of female-centric horror films, most notably last year's Most Beautiful Island, but earlier this year her feature film debut The Ranger bowed at SXSW. Dubbed a "punk-rock slasher," The Ranger stars The Transfiguration's Chloe Levine as Chelsea, a punk kid who, after a post-concert run-in with the cops, takes off with some friends in search of a place to lay low. The group ends up in the woods at a long-abandoned cabin which was once used by Chelsea and her family. What the group doesn't realize is that they're being watched by an overzealous park ranger, played by Jeremy Holm. Considering this is a slasher, I assume murder ensues. Wexler's take on the slasher includes a punk soundtrack featuring FANG, The Avengers, The Grim, Rotten UK and more, and while the trailer features only a little of the actual movie footage, the first clip offers a better indication of what we can expect from the movie. 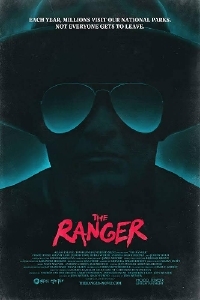 The Ranger opens at the IFC Centre in NY on August 17 and Laemmle Music Hall in LA on September 7. The movie is also still playing international film festivals including the upcoming FrightFest London.